Royal Windsor, on the banks of the River Thames, is home to the largest and oldest inhabited castle in the world - Windsor Castle, an official residence of Her Majesty Queen Elizabeth II. Prince Harry and Meghan Markle choose St George’s Chapel in the grounds of Windsor Castle for their May 2018 wedding. The best way to experience the sights of this ancient royal town and castle is a guided tour with one of our professional Blue Badge tourist guides. Elite Blue Badge tourist guides undergo two years of extensive training and represent the 'gold standard' of tourist guiding in the UK. 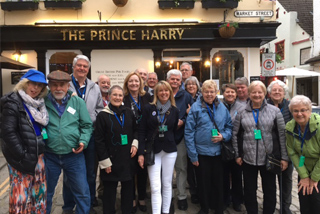 Our Blue Badge tourist guides are all passionate about Windsor, our heritage and are fun! No stuffy or boring historians here! Windsor Tourist Guides Ltd will bring history alive, entertaining your group and showing you areas of Windsor that many tourists never see. All our guided walks are tailor-made: we will suggest a walk around your itinerary and your group's interests. We do not do 'off-the-shelf' tours! Each year we accompany around 6,000 visitors on guided tours of Windsor, Windsor Castle and on evening guided town walks. We look forward to welcoming you to Windsor in 2019, come and see where Prince Harry married Meghan Markle.